The drifter deployment and support teams Yohana, Mukaka, Mercy, Abdulaziz (IMS), Ali (Pemba Fisheries), Matthew, Gaby and Dougal (NOC), and the Pemba fisheries patrol team, Khamis and Haji are now having a well deserved rest. The currents flowing through the Pemba channel are fast this time of year, and three of the drifters have already left the channel, heading northwards into Kenya. Six drifters were still in the channel at the time of writing this. They are following different pathways along the Pemba slope. Some are caught in an eddy, and the teams are hoping these will stay in the channel for a little while. The glider deployment and support team with three of their gliders before deployment. 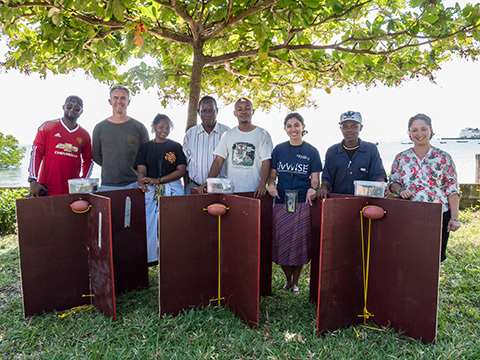 From left to right: Abdulaziz Alawy (MSc, IMS), Dr Matthew Palmer (NOC), Mercy Mushi (MSc, IMS), Daudi Mukaka (IMS), Ali Rashid Hamad (Pemba Fisheries Planning Officer), Dr Gaby Mayorga Adame (NOC), Ali Mwinyi (IMS technician), Sofia Alexiou (NOC). Following the trajectory of the drifters allow SOLSTICE scientists to measure the speed of currents in the channel between Pemba and mainland Tanzania. Knowing how water from the East Africa Coastal Current flows through the channel important for understanding the local ecosystem. It will also allow the scientists to plan next years fieldwork, when gliders and an autonomous under-water vehicle, known as the Gavia, will collect more detailed measurements. These field campaigns are part of a larger programme of research to better understand the small pelagic fishery in the Pemba Channel. The fishery for small pelagic fish (anchovies, sardines, mackerels, threadfins and herrings) is an important source of food and income for coastal communities in Tanzania. The abundance of these fish varies from year to year and may be closely linked with changes in the climate and marine environment, which can affect the food supply for both larval and adult fish. Understanding these connections is essential for the sustainable management of this important fishery, both at present and in a future influenced by a changing climate. The first day of the kick-off was dedicated to a field trip organised by the Institute of Marine Science (IMS), one of the Tanzanian project partners. The field trip introduced the international project partners, and the UK researchers in particular, to the socio-economic landscape of the Tanzanian Case Study, which is dedicated to the small pelagic fisheries in the Pemba Channel between the island of Pemba and the Tanzanian mainland. 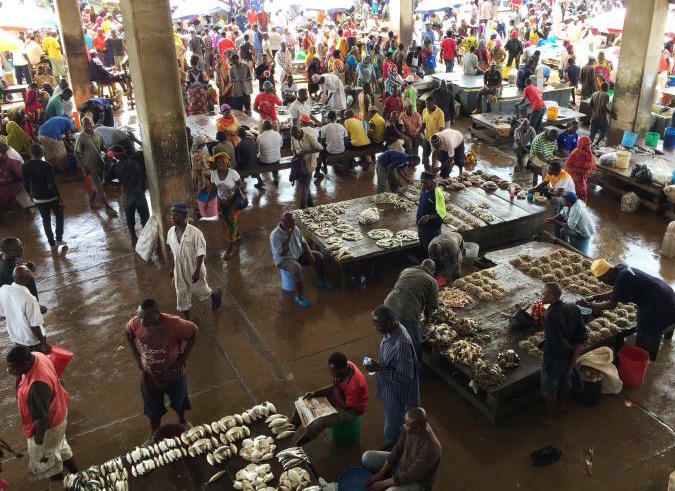 The field trip included a visit to Msasani pelagic fish community landing & processing site, the Ferry Fish Market (right), and Kunduchi fishing village. The second day was an intense all-day meeting of presentations and discussions of the case study activities planned for Kenya, Tanzania and South Africa. Topics included the marine technologies and scientific methodologies that will be used during the environmental field work, plans for the socio-economic studies and plans for engaging with local and regional stakeholder communities, and outline plans for training and education activities. SOLSTICE started with a “Big Bang”, putting together an exhibition and oral presentations which attracted a lot of attention at the 10th Scientific Symposium of the Western Indian Ocean Marine Science Association (WIOMSA). The SOLSTICE exhibition booth became a hub for project partners networking with local and regional stakeholders, news outlets and others interested in collaborating on capacity development, training, and other project activities over the next four years. NOC’s Dr Katya Popova gave a talk on ocean modelling. Prof Russ Wynn presented on the capabilities and benefits of Marine AutonomousSystems as a more robust and cost effective way to observe the marine environment. Regional SOLSTICE partners, IMS, TAFIRI, CORDIO-EA and WWF Tanzania, also had exhibition stands and posters presenting their research.